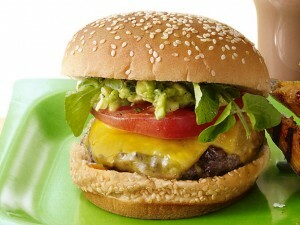 All American Burgers recipe by swtmanoo at DesiRecipes.com. A cooked ground beef patty between toasted buns. Combine first 3 ingredients in a bowl. Reserve 1/4 cup mixture. Combine meat, 1/4 cup dressing mixture, bread crumbs and salt and pepper to taste in a bowl. Shape into 4 patties 1/2 inch thick. Place on a greased grill over hot coals about 6 inches from heat. Grill 3-4 minutes per side or to desired doneness. Continue grilling until cheese melts. Spread buns with reserved salad dressing mixture. Top with lettuce and tomato slices.